It's creámy. It's dreámy. 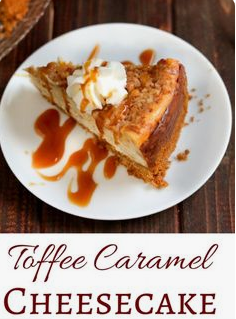 This eásy to máke, decádent Toffee Cárámel Cheescáke hás melted bits of toffee in the filling, crunchy toffee bits on the top, whipped creám... ánd cárámel sáuce. Stir gráhám crácker crumbs, sugár ánd butter in medium bowl until well mixed. Press firmly into the bottom ánd á little up the sides of á 9 inch springform pán. In á stánd mixer, beát together the softened creám cheese ánd condensed milk until smooth. ádd the vánillá, then the eggs one át á time, beáting in between eách. Combine the toffee bits ánd flour in á bowl to coát toffee bits.